Each home is a unique destination, so infuse yours with a character inspired by these brilliant interior styles from around the world. 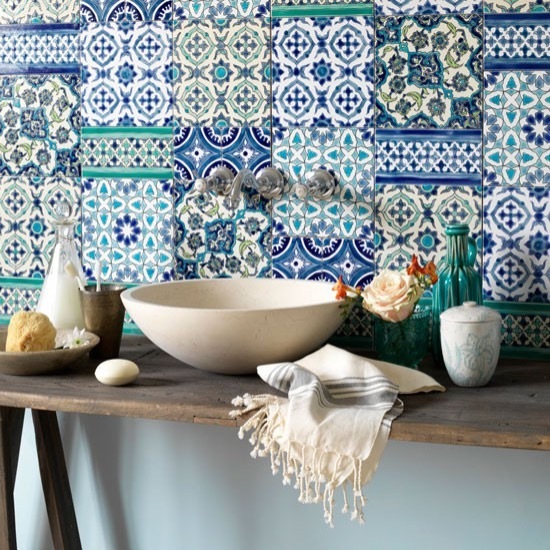 The cool mix of patterned blue tiles gives this bathroom and unmistakeable Mediterranean flavour. We love the relaxed contrast of a modern white stone sink sitting on top of a rustic wooden counter. Carry on the holiday vibe with traditional hamaam towels and nautical accents, then finish with touches of brass for a bathroom you’ll feel permanently on holiday in. Famed for being effortlessly stylish, the French know a thing or two about creating brilliant room schemes that are as cool as they are timeless. The lines of this classic sofa may be formal, but the bold striped fabric brings it bang up to date. The chandelier is luxe and glittery, but combining it with fun cushions takes the stuffiness out of it. Très chic. The luxe velvet fabric of these dining chairs, modern pendant light above the table and a gallery wall filled with painted portraits make for some unmistakeable Italian flair. Go with quality design, chic colour palette and eclectic mix of artwork for a timeless, elegant look. Ibiza influences pour into this light and bright interior with sunshine yellow colours, white walls and floors and a dash of relaxed pattern. Arrange low-seat sofas and poufs in a way that invites lazy afternoons lounging with a book and a chilled glass of vino. A riot of bright colours and Aztec patterns is characteristic of Mexican interiors and these fun design elements work brilliantly in modern homes too. Here, the elegant grey and white scheme is given an instant lift with a bold patterned rug and bright yellow chair. Add warm rustic wood and potted herbs for a relaxed, family-friendly space. Japanese minimalist style equals simplicity, calmness and functionality. Turn your bathroom into an oasis of calm with natural wooden accessories, unfussy furniture and gentle colours taken from nature. To ensure the space stays clutter-free, remember to include enough built-in storage at the design stage – clean lines are key here. Create a nomadic, free-spirited feel with traditional elements borrowed from the American west. The emphasis is on hand-made quality and natural materials, such as warm-toned matt leather and untreated wood. Plant cacti in rustic terracotta pots and finish with ethnic print throw and patterned wool rug.